The 2017 WIDER Annual Lecture was delivered on 24 October, as part of UN Day celebrations. More information is available below in the programme for the day. Missed the event? Watch the live-stream video of the 2017 WIDER Annual Lecture here. 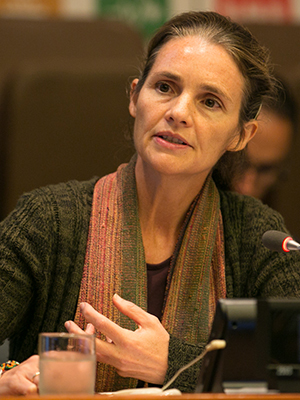 Professor Sabina Alkire, Director of the Oxford Poverty and Human Development Initiative (OPHI), gave the 2017 WIDER Annual Lecture during which she discussed implications of using the Global Multidimensional Poverty Index (MPI) and other poverty measures for achieving the United Nations 2030 Agenda for Sustainable Development, particularly Sustainable Development Goal 1 — to end poverty in all its forms everywhere. The Global MPI goes beyond the traditional focus on income and growth in measuring poverty to capture multiple deprivations experienced by poor people around the world. It is unique in its ability to show not only who is poor but how they are poor, in terms of living standards, education, and health. The Global MPI is a headline indicator of acute multidimensional poverty that can be compared directly across countries. All of the indicators used for constructing the Global MPI have been mapped in relation to SDGs, which means that the MPI acts as a barometer of poverty-related SDG attainments. The MPI allows countries to identify gaps in policy and thus target the most vulnerable populations — whether they are divided along, ethnic, gender, or generational lines — for relevant interventions.